There's no denying people love gore as long as they are not on the receiving end. Unfortunately 6 students died in Aminbazaar because people couldn't get enough of their thirst for misplaced rage. The students went to the secluded robber ridden area where a mob rushed upon them on 18 July. The lone survivor, Al Amin says plainclothes police just watched his friends get killed from a couple of yards away. 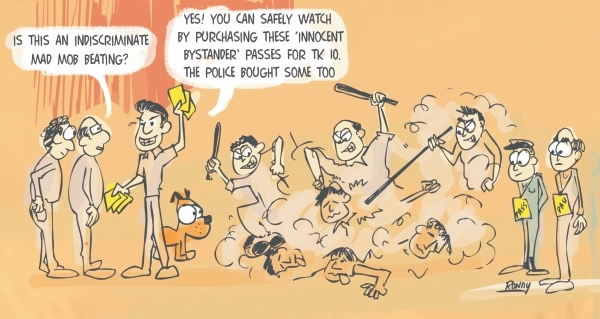 Now you can't expect police to get into a fray and risk getting hurt. They have to pay for their own uniforms and the price of clothing before Ramadan goes sky high. Earlier, on July 11, a truck loaded with students at Mirsarai of Chittagong drove into a ditch killing at least 42 students and two others. Police this week arrested the unlicensed driver. He's a farmer with a fake license who was alleged to be talking on the mobile phone during the accident. Too much social networking. A study shows a 20-year-old driver with a cell phone has reaction times the same as a 70-year-old driver not using a cell phone, according to University of Utah psychology professor David Strayer. Speaking of which, there's a law that says anyone caught using a mobile phone while driving has to pay a nominal fine of Tk 500 or serve one month in jail or both. How that will be applied requires several other laws. Our factories run on gas. Our power plants run on gas. Our politics runs on gas. And don't forget the transport system. Expensive cars run on gas, which is one way for rich people to stay rich. So without gas, nothing will run. Yet, we are losing gas worth thousands of crores of taka through tube wells and thousands of holes in the gas field in Brahmanbaria. Cost to plug it all? A Tk 1,000 crore project. It's finally been started with our usual penchant for tardiness, five years late. An Australia team is working on it. Unfortunately none of the Australians are Croc Hunters (aren't they all?). Further gas plugging is going on with CNG filling stations yet again made to stay closed between 3:00pm and 9:00pm during Ramadan. Apparently, this will help improve gas supply to power stations. People better not be without their Star Plus serials in the month of hunger-anger. Indian Border Security Force (BSF) secure the Bangladesh-India border by playing target practice with Bangladeshis that stray too close to the edge. A Bangladeshi farmer was beaten to death by BSF on July 22 in Chuadanga. Apparently, the farmer was working at his paddy field near border pillar No 90 when five to six BSF members entered Bangladesh territory and forcibly tried to take Selim away to the Indian side without any reason. At roughly the same time, India and Bangladesh inaugurated the first-ever official border haat on the no-man's land here in efforts to bring economic benefits to the people of the area. Around 500 people from the two countries were allowed in the small haat area, approximately the size of two football pitches. Now you can buy your chips, drinks and other snacks while you watch BSF have a go at our people. That's you. Sugar becomes gold before Ramadan. The government decided the price to be maximum Tk 65 per kg but retailers continued selling over Tk 70. That's not just gold, that's rare Lara Croft Tomb Raider gold. The salesmen say they buy these at higher prices. Factories say they sell them at the right prices. The wholesalers in the middle are apparently getting fat. It's always the middle portion that gets the flab. For a while last week, retailers stopped selling sugar because if they were caught selling at high prices, they would get fined TK 20,000. It's as good a time as any to start on the New Year (2011) diet resolution. Q1. What music do you play in your car? Q2. What do you usually wear during an average hangout? Q3. What is your facebook name most like? Q4. You meet up with your friends. How do you greet them? Q5. Your friend has the skin of some peanuts you had earlier stuck to their tooth. How do you point it out? Q6. You see a random cute baby at the mall. What do you do? Q7. At your friend's house, how do you act around their parents? Q8. If someone does something mean to your friends, how do you react? d) Smiling at every attractive person you see. 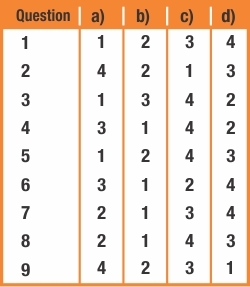 Calculate your marks from the table given. If your total mark is between 0 - 9, then you are the sane person in your group. But don't always take it as a compliment, because people may be calling you 'Mother Hen' behind your back. You never embarrass anyone, and people usually take you when they want to make an impression on someone. 10 - 18, then you can make your friends cringe sometimes. Though they are probably used to your quirks, you can appear strange to other people. You don't need to change, because every group needs to have a goof like you to laugh about from time to time. 19 - 27, then something is very wrong with you. You either don't know about the rules of everyday life, or choose to crush them with your crocs. Just do not be surprised if one day you find out that you have been left out, because people may not want you around formal events. 27 - 36, then it's a surprise that you even have friends. People like you should be locked up so that they can't go around elevating other people's blood pressure while posing as a health risk.